Ignition Switch Key / Glove Box Key? Discussion in 'Early CJ-5 and CJ-6 Tech' started by johnny and sandy, Aug 10, 2017. Did they use the same key for the ignition switch and for the glove box? That would probably be a no. I do not believe the glove-box came with a key-lock, just a push-button lock. Some of the early CJ5/6's had a locking glovebox, and at least the one I knew of, the keys were not interchangable. The ignition key has 6 or 7 flats on the head, and the glovebox key has a round head. The lock I use in mine came from a hardware store. It is from a bundle of parts for installing locks in mail-boxes. My '57 had the locking glove box button. PO had a key (round head) but it was so worn it didn't work. He installed a hasp that I had to remove and fill in and weld up all the holes. Tonk had a key that worked on both the ignition & glove box, however as he would have come originally with the floor starter I'm assuming somebody arranged for this. FWIW, my "new to me" '56 CJ5 has a keyed glove box button but the ignition key doesn't fit it. Has toe/floor starter too. While it looks original, it's hard to tell if the ignition switch has been replaced at some point over time. Somewhere I've got a bunch of loose keys that my dad collected over the years from virus projects and I'm sure that something can be found that works. IIRC they are different. That was the protocol back then. 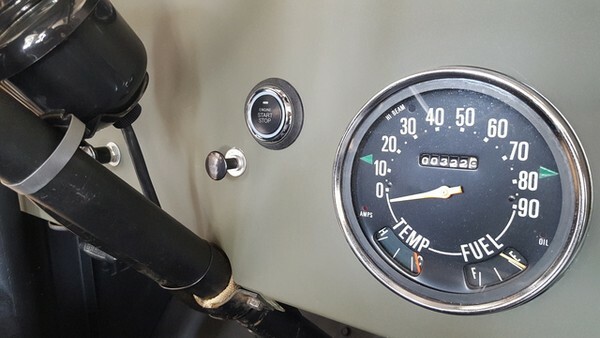 Both the keyed glove box locks that were available as an option and the original ignition switches used Briggs & Stratton GRV-3 (Groove-3) Jeep-emblem keys. As Donny noted above, the original ignition switch keys had octagonally shaped heads, while those used for the glove boxes, as well as the doors on trucks, etc., were round-headed - but both types shared the same GRV-3 keyway. In case anyone is interested, or would just like to see an example of the round-headed original Jeep keys, an eBay seller in Israel has some NOS CJ5/6 keyed glove box locks with the original keys listed....see eBay item number 311687568080. Wouldn't the ones he has that say Jeep on them have been for later models? Like mid 60's? Yes, I believe you're correct - to the best of my knowledge, the earlier (mid-50's-early 60's) original CJ keys were Briggs & Stratton GRV-3, but did not have the Jeep emblem stamped on them. I took my glove box lock to the Locksmith here in town, and he said that they were different, he said that the ignition switch was from a different supplier than the glove box lock. My keys a totally different. Mine match, push a button to open the glove box...Push a button on the dash to start the Jeep. tripilio, Beach66Bum, GeoffreyL and 2 others like this. lol OEM! you can't fool me...that Tach is totaly not original! That driver isn't OEM either. Yes, two different keys for 1966 CJ5. Octagon head for ignition key has a "Jeep" stamping, and glove box key has round head. Glove box is stiff cardboard, but the metal door locks. I know my first one, a '59 had cardboard. I would imagine they were all cardboard including wagons and trucks. My wagon had cardboard. I've always had the theory that vehicles like wagons and trucks wouldn't need the locking glove box and obviously the CJ5 and 6 would. Love it! Dumb question: is it water proof? I would like to install one but here in South Florida we have rain one day and the other day too! I would hate to be stranded because it got wet! Do you have a part number? Thanks! Dumb question: is it water proof?